Posted on October 10, 2018 at 8:20 am. Echoing a recent trend in other states, for the first time a lawsuit has been filed in Minnesota alleging that websites — in this case, belonging to a county and couple of cities — violate disability law. Posted on August 15, 2018 at 7:53 am. A federal appeals court overturned a lower court and ruled a blind plaintiff can pursue an Americans with Disabilities Act lawsuit against Dunkin Donuts L.L.C. for allegedly having an inaccessible website. The case is part of a trend, with more courts ruling against companies over the issue of website accessibility, while the number of lawsuits alleging ADA violations related to website access grows dramatically. Posted on August 9, 2018 at 7:17 am. Working with the IT Foundation for the Visually Impaired, Freedom Scientific has announced country-wide licenses for Hungary, which could benefit as many as 300,000 people living in the country. Any individual or entity can now apply to the Hungarian government for a copy of JAWS, ZoomText or MAGic with a free annual license. Posted on June 26, 2018 at 8:03 am. A federal appeals court just breathed new life into a disability access lawsuit filed against restaurant chain Hooters, permitting a blind plaintiff who claims he could not access the company’s business website to proceed with his ADA claim—despite the fact that the company was in the midst of fixing its website at the time the lawsuit was filed. Posted on June 22, 2018 at 7:38 am. A group of 103 lawmakers yesterday wrote to Attorney General Jeff Sessions seeking further clarity on how the Americans with Disabilities Act applies to websites. The letter came in response to numerous demand letters that banks and other businesses have received from plaintiffs’ firms asserting that websites are not accessible to speech and hearing impaired customers, as required by ADA. Posted on June 13, 2018 at 7:49 am. As a follow up to our article titled Best Automated Accessibility Assessment Tools, we decided to focus on accessibility tools that are particularly useful for Web developers. In this article we’ll discuss these free tools, and how they can help to streamline your development process. Web-AIM’s Color Contrast Checker displays the contrast ratio between foreground text and background colors to help designers select combinations for maximum readability and accessibility. 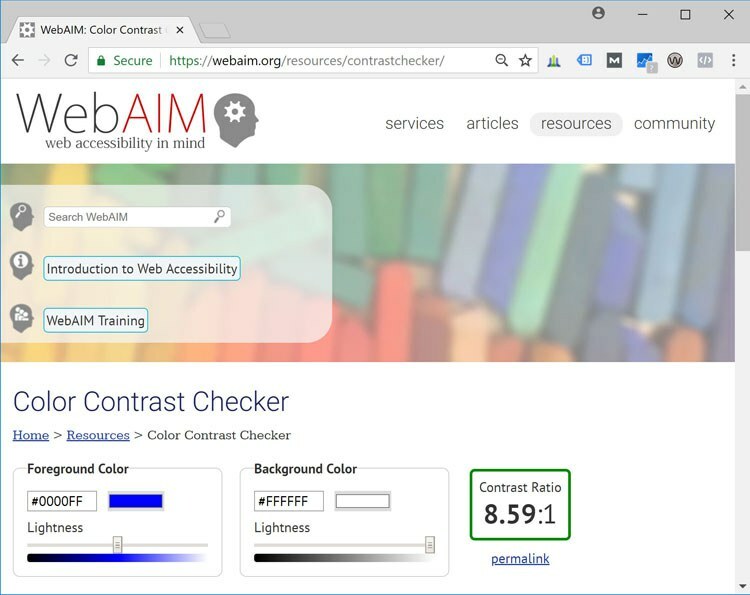 Web-AIM’s checker takes two hex color values, and displays the contrast ratio between them. 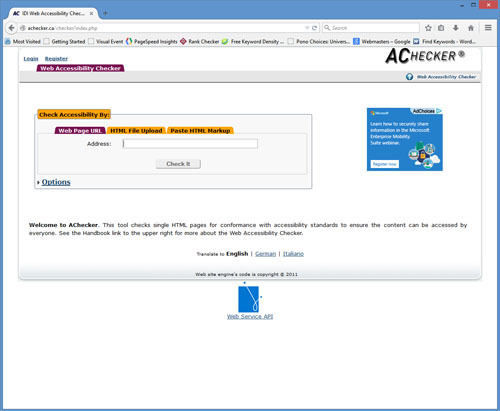 The checker also displays pass/fail values for WCAG priority AA and AAA compliance. WCAG 2.0 priority AA compliance requires a minimum contrast ratio of 4.5:1 while WCAG 2.0 AAA requires a contrast ratio of 7:1. NonVisual Desktop Access, or NVDA, is a free screen reader for Windows PCs. NVDA is one of the most popular screen readers — with over a quarter of respondents in WEB-AIMs Screen Reader User Survey #7 using NVDA (https://webaim.org/projects/screenreadersurvey7/) . There is a bit of a learning cure for using NVDA screen reader, as there are many keyboard commands to learn to become proficient with this technology. There is no better tool though to get a real-world picture of website accessibility. 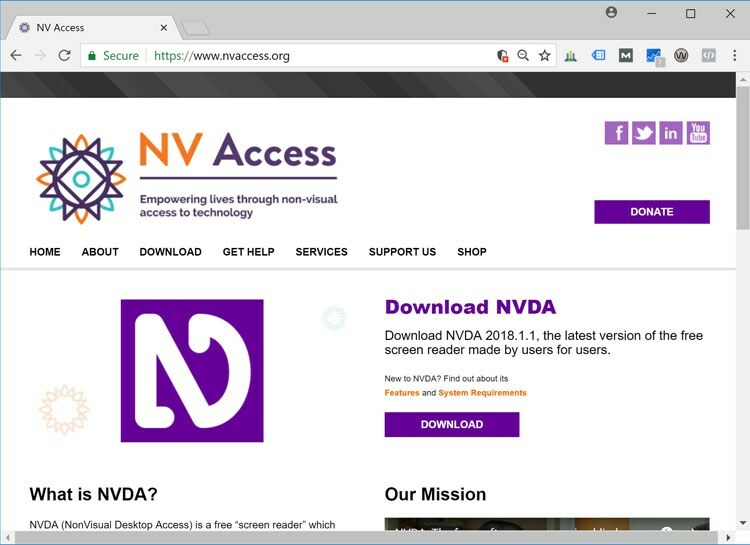 By using NVDA screen reader, developers can test website navigation systems, web forms, and other page elements to ensure that they work seamlessly with assistive technology devices and a keyboard only. 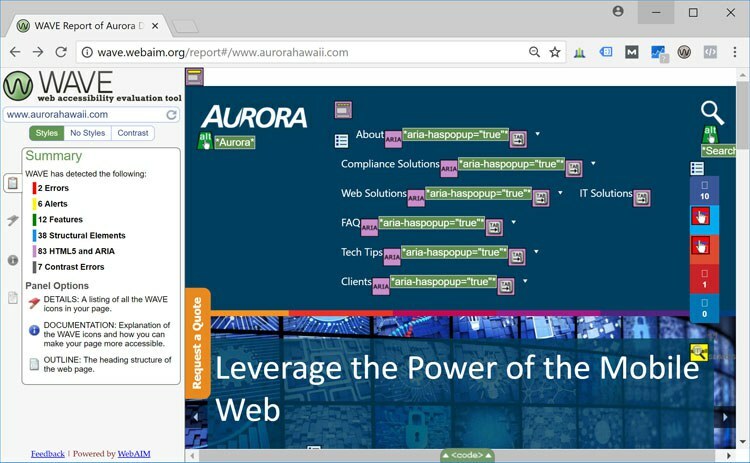 Web-AIM has published a quick start guide titled Using NVDA to Evaluate Web Accessibility for developers looking to incorporate NVDA into their accessibility testing process. No list of accessibility tools would be complete without mentioning Web-AIM’s Wave Accessibility Evaluation Tool. This free tool is the most comprehensive automated assessment tool available today. Wave will scan your pages for WCAG 2.0 failures, and analyze color contrast for page elements to alert you to any potential contrast problems. Wave is easy to use, and includes both graphical and code views to help you easily identify the source of WCAG 2.0 failures and warnings. If you’re using Chrome browser, there is also a FREE extension for the Color Contrast Checker in Chrome’s web store . The W3C’s HTML and CSS validators are essential tools for identifying markup and structural errors on your pages. 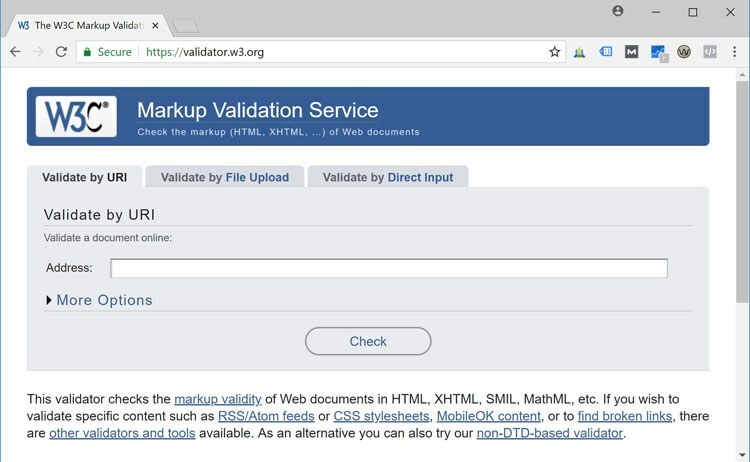 The W3C’s Markup Validation Service and CSS Validator allow you to scan pages for markup errors by URI, file upload or by direct input. Both tools displays validation errors and warnings by line number to allow you to easily identify and fix errors in your HTML and CSS code. The W3C, Web-AIM, and NV Access provide excellent tools for web developers to validate, scan and test web content for accessibility barriers. The tools that we’ve covered can be used throughout the development process to identify potential barriers, and to ensure that websites work seamlessly with assistive technology devices. With so many free tools available, it’s easier than ever to integrate accessibility testing and validation into your team’s development process. 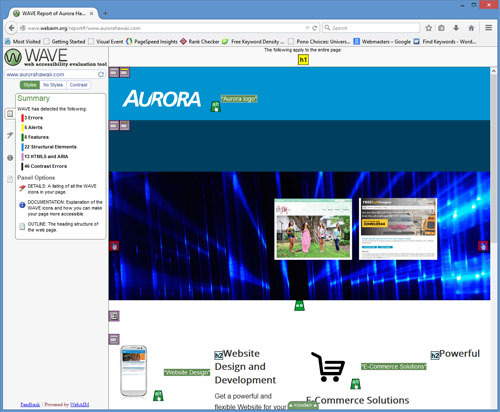 Aurora provides training and professional development for website developers, designers, and content managers. Our training series cover: WCAG 2.0, accessible development techniques, and testing procedures to help development teams get up to speed on accessibility. Posted on June 1, 2018 at 8:05 am. Automated Accessibility Assessment tools are a great way to begin a comprehensive review of accessibility—and can help you identify critical accessibility issues with your website. These tools can help you identify common accessibility problems such as missing alt text, low contrast elements, invalid HTML/CSS markup, and more. Several of these automated tools also include markup warnings and manual checks for further testing. All of the tools included in this review are free web-based services. Please note that the tools listed below are only a starting point to help you identify potential accessibility problems with your Website. A complete review should always include manual testing with a screen reader or other assistive technology device to insure usability and accessibility. 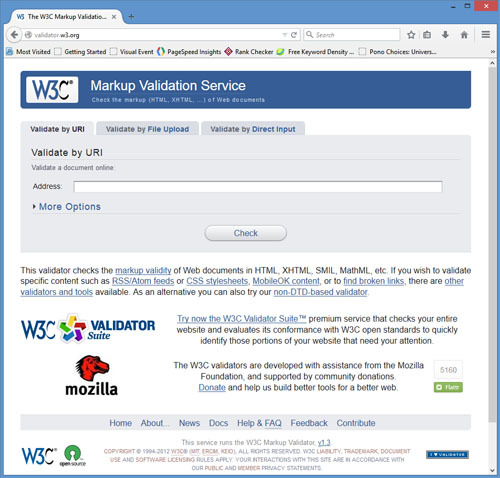 The W3Cs Markup Validation service is an excellent starting point for any accessibility review. This tool scans your site for invalid markup based upon the type of source document (XHTML, HTML5, etc)—and returns any validation errors or warnings. The service is free, and there are no limits to how many pages you can test. 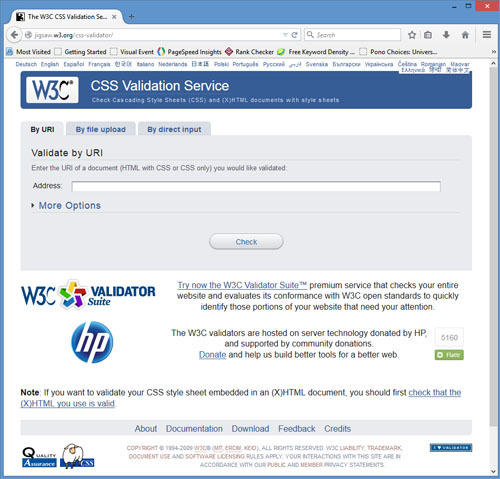 The W3C also offers a premium service called W3C Validator Suite which will check your entire website for validation errors. Once you’ve tested your site with the W3Cs markup validation service—you’ll want to test your CSS to make sure that it’s valid. The W3Cs markup validation tool accepts the URL of a webpage and scans all of the CSS files linked from a web page. The CSS validator returns a list of valid CSS declarations and any errors encountered during the scan. It’s important to fix CSS errors identified during this process as they can pose problems for assistive technology devices. Wave’s Evaluation tool is an excellent choice for automated accessibility reviews. It features a graphical display of accessibility warnings and errors that is easy to read. The scanner includes filters for WCAG A, AA, and AAA compliance, and allows you to preview your site without styles or with user-specified styles. Wave’s evaluation tool also includes contrast warnings to insure that your pages are readable by users with low vision. AChecker is a web-based automated evaluation tool that includes HTML and CSS validation options. Using AChecker—you can test your site against a number of conformance guidelines including: Section 508, WCAG A-AAA, and more. Known problems are displayed in an easy to read format and include line numbers for easy identification. AChecker also lists potential problems for further investigation. Automated Accessibility scans are an integral part of any assessment strategy. They provide a first line of defense to quickly identify accessibility barriers, and can help you streamline website accessibility assessment. When combined with manual reviews (including tests with assistive technology devices)—these tools can help you meet or exceed your accessibility compliance goals. Aurora Design and Consulting provides Section 508 and WCAG 2.0 Compliance Testing to help you meet your compliance goals. Posted on August 28, 2017 at 8:11 am. Tackling accessibility compliance can be a daunting task. Businesses and non-profit organizations looking to achieve compliance are often left wondering where to begin. This article will cover tips for getting started with website accessibility to help you on the road to achieving your compliance goals. Where do potential accessibility barriers exist in our technology infrastructure? What level of accessibility do we need to achieve compliance? How do we engage stakeholders in the process? How do we systematically address accessibility barriers and verify compliance? Answering these questions will help you to identify technology assets, determine an appropriate level of accessibility compliance, engage and communicate with stakeholders, and develop a plan to achieve compliance. Depending on the size of your organization, information technology assets can be spread across departments, agencies, and divisions. Getting an inventory of these assets, is critical to beginning any accessibility initiative. An accessibility policy is critical to any accessibility initiative. A good accessibility policy lays the foundation for a successful accessibility campaign, and communicates your organization’s accessibility goals to all stakeholders. Refer to the W3C’s Developing Organizational Policies on Web Accessibility for more information about developing an accessibility policy. Meet with stakeholders including your IT support team, leadership, and administrators to discuss implementation of your new accessibility policy. Discuss stakeholder responsibilities, target conformance level, systems impacted, and your target date for accessibility conformance. Engage third-party accessibility solutions providers as needed to streamline the compliance process, and move forward with your accessibility implementation plan. Take the worry out of compliance with our website accessibility compliance solutions.